Chief rabbi of Cairo, Egypt; preacher and Biblical commentator; flourished in the seventeenth century; died at Jerusalem. He was the author of "Darke No'am" (Venice, 1698), responsa on the four parts of the Shulḥan 'Aruk, namely: 13 on the Oraḥ Ḥayyim; 13 on the Yoreh De'ah; 68 on the Eben ha-'Ezer; and 57 on the Ḥoshen Mishpaṭ. It was prefaced and edited by his son Abraham ha-Levi. 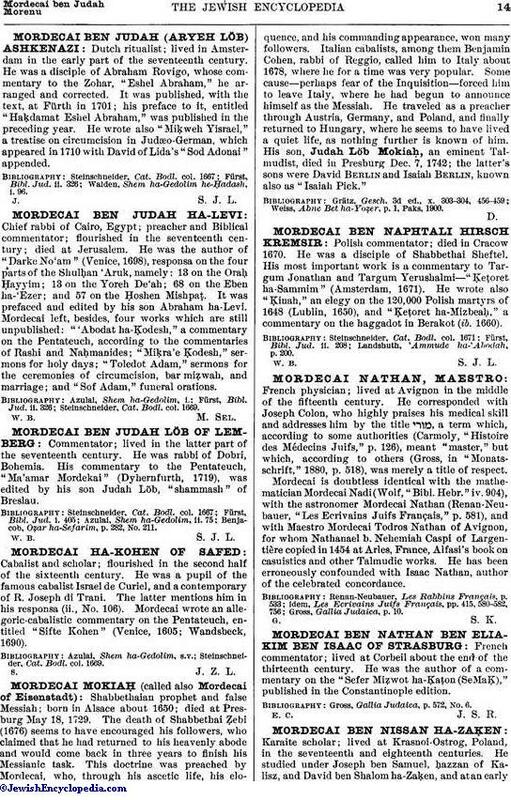 Mordecai left, besides, four works which are still unpublished: "'Abodat ha-Ḳodesh," a commentary on the Pentateuch, according to the commentaries of Rashi and Naḥmanides; "Miḳra'e Ḳodesh," sermons for holy days; "Toledot Adam," sermons for the ceremonies of circumcision, bar miẓwah, and marriage; and "Sof Adam," funeral orations. Steinschneider, Cat. Bodl. col. 1669.